In the pilot of "Star Trek: Voyager", the new starship USS Voyager was taken to the Delta Quadrant by a powerful being called "the Caretaker" on her first mission to the Badlands near Cardassian space. Alone in a unexplored quadrant, Voyager attempts to find a way back home from the northern edge of the Galaxy, 75000 light years away from Earth. In this chapter, the seven year journey of Voyager and all its stations shall be examined more closely, and the discoveries about the Delta Quadrant, its planets, alliances, empires and astronomical phenomena, which were made during this time, shall be evaluated. While Voyager's journey through the Delta Quadrant was considerably better documented than for instance the subdivision of the Galaxy or the structure of the Federation at the beginning, and was more simple and logical than many other parts of the Star Trek Cartography, in the meantime this journey have rather complicated due to numerous continuity problems, contradictions, but also new basis information. The latter fact has lead to the problem that concerning Voyager's journey, one cannot simply use 1000 ly/year regularly travel distance per year plus the leaps made in the course of the seven year journey any longer. How Rick Sternbach, the "keeper" of the official route of Voyager (that we unfortunately will not know exactly until the ST:VOY TM is published) recently remarked correctly, the distance of Sol to the Galactic core, the initial distance of Voyager from Earth and her bearing are decisive for a depiction of Voyager's journey. A further cornerstone of the Voyager cartography is also Voyager's average speed which has been officially fixed recently. However, the problem arises that all these "fixed values" aren't that fixed in the end. This even applies to the distance of Earth from the center of the Galaxy. Yet, I tried to use the most recent and least contradictious values. Although NASA nails down this important distance with about 25,800 ly (7.9 kpc), the out-dated, too high figure of 30,000 ly is still very common, and even the most recent Milky Way map in the ST:DS9 TM uses this value. Nonetheless, the more recent and precise distance shall be used as the basis for the calculations here, since otherwise, problems arise concerning Voyager's position with regard to the Beta Quadrant border since year five of the journey (further details later). Again there are two contradictious figures regarding this cornerstone: in the pilot [VOY] Caretaker still 70000 ly (a journey of 75 years) were mentioned, but newer episodes ([VOY] One etc.) and official documentations have established a distance of 75000 ly. Of course, one could assume that the first figure is the distance of the Caretaker from Bajor and therefore the distance between Bajor and Earth is responsible for the discrepancy. However, this would result in Bajor being located far above Earth, what is actually not the case. Therefore, in this analysis 75000 ly will be used, because in the end, this assumption is necessary to avoid the Beta Quadrant problem. This is the most uncertain figure, because we have not a clear on screen evidence, but can only measure in official maps. 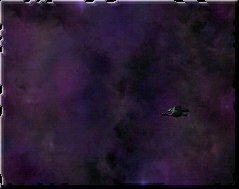 Although Rick Sternbach explicitly wrote in a newsgroup recently that these maps only lay down a preliminary course of Voyager that is about to change, we can actually only use the Milky Way view in the ST:DS9 TM. From this map, we can extract an angle of 23.36� for the line Earth-Voyager. If Voyager flew a course parallel to the Alpha/Beta Quadrant border, this angle would simultaneously also be the bearing relative to the forward direction of the vessel. However, courses are usually given with relationship to the center of the Galaxy. Voyager's actual azimuthal course therefore is 008, although in the end, we only need the first figure for our calculations. Surprisingly, concerning Voyager's normal cruising speed some considerable changes were made recently, although both fans and official sources presupposed for years that Voyager covers, based on a journey of 75 years and the revised distance of 75000 ly, 1000 ly per year, what corresponds to warp 7.9. However, there hasn't been an explicit on screen evidence, which was finally made in [VOY] Pathfinder and caused some turmoil among the Voyager cartographers. Probably to avoid a too early approach to the Beta Quadrant, which was only about 500 ly away after the last leaps at the beginning of the 6th season, but which doesn't seem to exist in the Voyager universe, this speed was reduced drastically and therefore Voyager was pushed some thousand light years back into the Delta Quadrant. 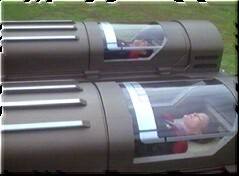 In fact, the figure of warp 6.2, mentioned in this episode, also seems to be more logical in view of the fact that due to constant breaks on planets and course deviations for exploration or delays because of hostile species, Voyager's cruising speed (said 1000c) is lowered considerably in the year's average. Because of this, it has been suggested to use both figures in calculations: to assume warp 6.2 (leading to 438 ly per year) for the actual distance covered in one year or subjective statements (journey cut off by 5 years / lengthened by 2 years) and still use 1000c (i.e. journey without breaks) for leaps of longer distances (like "journey cut off by 10 years by covering 10000 ly"). There are some special cases, however, caused by the shortened travel time in the first year and by avoiding Borg space in the 4th and 5th year; problems, that will be elaborately dealt with later in the text. 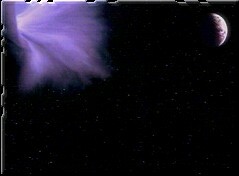 After Voyager has been pushed to the North-Western part of the Delta Quadrant by a displacement wave caused by the Caretaker, from this far away position her voyage home begins, which would take them 75 years at maximum cruising speed, but will last the double till triple time because of course deviations, astronomic obstacles and other delays. 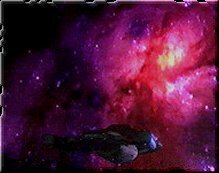 In the first two years, Voyager travels through the territories of the Kazons and Vidiians and reaches in year three the Nekrit Expanse and therefore the frontier to a completely unknown part of the Galaxy. Here, Voyager encounters the Borg collective at the end of the third year, whose core territory she can cross without graver damages. However, until the middle of the 5th year, Voyager has to avoid the Borg and their flying routes. Nonetheless, in this year the crew manages to cover half of the entire distance by using new technologies such as slipstream and transwarp. Consequently, Voyager is now, in the 7th year of her journey, only a few thousand light years away from the border to the Beta Quadrant. An extended route table of Voyager's journey with additional data, for instance the galactic positions in different coordinate systems, which could be interesting for own projects, you can find in the resource The route of the USS Voyager. For the calculation of Voyager's distance to Earth at a particular time (and therefore the distance of the regions of space crossed and the planets visited at this time etc. ), you can use the following step-by-step instructions. 1. Look up the stardate of the episode, e.g. in the ST:VOY Guide. 2. Choose a reference distance to Earth from the above table by comparing the stardate with the table stardates. Important: You have to ignore all yearly covered distances (Stardate xx0000-xx999)! Example: Stardate 51461.5 is bigger than 51268 in 6., but smaller than 51978 in 8.; the reference distance to Earth is therefore 62134 ly. 3. Beside the now following normal deduction of the percentage of the yearly covered distance (1), 2 special cases have to be considered: (2) in the first year (stardate 48317-48999), Voyager only travelled 300 ly, therefore the yearly distance being accordingly smaller, and (3) between stardate 51008 and 52619, a Borg correction factor has to bee added to the distance, because during this period of time, Voyager's journey became 2 years longer because of avoiding Borg space. Example: Stardate 51461.5 is between 51008 and 52619, thus variant (2) has to be used. Enter the stardate and reference distance 62134 ly at (2) and click on the button to calculate the momentary distance of Voyager from Earth at this time. With the locations of Voyager's journey and a possibility to calculate her exact positions, we also know the positions of all planets visited by Voyager and the territories crossed by the ship. Consequently, the "official" Delta Quadrant is paradoxically much better known than the Alpha or Beta quadrants. Therefore, the following passages deal with the significant locations of the journey of the USS Voyager. Finally, at the end of the chapter a short prospect for the further course of the still continuing journey will be given. Since the USS Voyager was taken to the Delta Quadrant by the Caretaker not before stardate 48317 (that is in April 2371), the first "year" of Voyager's journey covers only 683 stardate units or 249 days. Consequently, at an average speed of warp 6.2 (438c), Voyager can only travel 300 ly out of the usual 438 ly in 2371. With such a short annual distance, the galactic surroundings has to remain the same to a large extent during this first year - and indeed, Voyager stays the entire year in the sphere of influence of the Kazon-Ogla, Vidiians and Talaxians, who they contacted already in the first weeks in the Delta Quadrant. On stardate 49690, the crew of Voyager had no choice but to leave Captain Janeway and Commander Chakotay on an uninhabited planet that they called ""New Earth", after on a routine mission, both had been infected through insect stings with a dangerous, extremely infectious disease, which does not break out only in the biosphere of the planet. When Voyager continues her journey under the command of Tuvok, already 17d have passed, during which the doctor unsuccessfully searched for a cure. Only after six weeks, during which Voyager kept on flying with normal speed and, according to Tuvok, covered 70 ly in this time, what corresponds to an average speed of warp 6.8, Voyager has the opportunity to get a cure from the Vidiians. Although Tuvok set a speed of warp 6 after they escaped the Vidiian trap, it is unlikely that Voyager stayed at that speed for the whole time of the flight back to the planet, because then they would have needed a longer time than for the outward flight. Therefore, we can assume that it took Voyager between 3 weeks (at warp 8) and 5 weeks (at warp 7) to travel back to "New Earth". Using the first, more optimistic figure, the crew therefore loses 80 d all in all, what corresponds to a annual distance shortened by 95.998 ly at an average speed of warp 6.2. 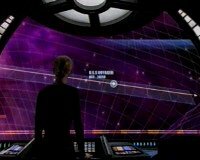 At the end of the episode, Captain Janeway resumed the course home at warp 8 in order to make up the lost time, but is this possible at all? Day 24 of the involuntary "shore leave" (probably counted without the 17d stasis) corresponds to stardate 49690.1 according to the episode, what places the resumption of the voyage home on stardate 49892.7. In the remaining 107.3 stardate units or 39.1645d, Voyager could have indeed make up the lost distance of 95.998 ly with an average speed of nearly warp 8 (warp 7.684) , and with an average speed of somewhat more than warp 8 (Warp 8.66), she could additionally travelled the rest of the annual distance of 46.9974 ly that has still to be managed in the remaining time. During her journey without captain and first officer, the crew has contact to the Vidiians for the last time, therefore Voyager definitely leaves the sphere of influence of this species. Provided that Voyager made first contact with the Vidiians on stardate 48532.4, their territory seems to cover at least 535 ly, although a large extension "above" Voyager's position at the time of first contact is not impossible. Despite no large leaps and the usual annual distance of 438 ly, the third year is a year of changes for Voyager's journey. After two years, she finally leaves the known space populated by the Kazons and Vidiians and ventures to new, unknown regions of the Delta Quadrant. Already just at the beginning of the year, on stardate 50032.7, the crew of Voyager has the last contact with the Kazon, what seems to imply that they finally leave their "territory" (better called the space dominated by the - nomadic - Kazon sects). It is unknown how far Kazon space extends "above" the Ocampa homeworld, where first contact were made by the crew of Voyager on stardate 48317. 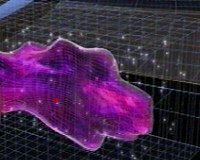 However, this planets seems to be located in the border zone rather than in the center of their space, which is dominated by more powerful sects than the Kazon-Ogla, for instance the Kazon-Nistrim. Regarding the space crossed by Voyager within the last 2 years (since the arrival in the Delta Quadrant on stardate 48317), this leads to a diameter of about 750 ly, what can be considerably less (using a lower annual average speed of Voyager in the first year) or more (based on the assumption that Kazon space extends over several hundred light years above the Ocampa homeworld. A diameter of this magnitude seems to be plausible in view of the fact that the Kazon, being nomadic living traders and conquerors, must naturally populate a larger region of space, what necessarily means that every single planet within this territory must be in their hands, but that the region can have larger "gaps". At any rate, these extensions of the influence spheres of the Vidiians and Kazons support the low annual average speed of 6.2, since based on the maximum cruising speed of Voyager (warp 8 = 1000c), the territories of this rather insignificant species would cover 1500-2000 ly. 1. At any rate, it should be taken into account that at the time the episode "The Price" was produced, the distance figures were of course not calculated with regard to a possible future series, and vice versa, the authors of Star Trek: Voyager surely didn't intended to continue the story of the two left Ferengi at the exact time when Voyager had reached the according point in space, but when they had an idea for a continuation. 2. On the other hand, the 70000 ly could be regarded as a proof for Voyager's initial distance to Earth, 70000 ly, which was still mentioned on screen regularly in the first and second season, while since the 4th season, in the episodes a distance of 75000 ly was used ("One" etc.). In this case, Voyager would still be more than 69000 ly away from Earth in 2373, with 70000 ly being a plausible approximate value. 3. Another explanation is based on the fact that the 70000 ly in "The Price" refer to the distance from Barzan, not Earth. With the Barzan's distance from Earth and its relative galactic situation, the discrepancy can be then easily explained: if Barzan is located above Earth in the upper part of the Alpha- or Beta Quadrant, how it can be actually seen in some official maps, the distance of 75000 ly is of course shortened due to the nearer position of Barzan relative to the Delta Quadrant. On stardate 50252.3 - the USS Voyager is still approximately 74150 ly away from Earth - the ship reaches the extensive territory of the mysterious Swarm. It would take the crew of Voyager several months to fly around this region of space. Therefore the crew decides to decides to cross the territory of the Swarm at a narrow place - how we can see in the map shown in this episode, which has been reproduced in the right-hand chart. 1. Travelling through the territory will last 4 days at very high warp speed. 2. Sustaining warp 9.75 for 12 hours, Voyager has travelled a third of the distance. With the first statement, exact calculations aren't possible, but perhaps with the second one. However, the question arises if the maximum speed of Voyager is meant (warp 9.975) or really warp 9.75. To simplify the process and because the first speed is nearly 3 times as high as the latter one (what would make the territory too big), we use the speed mentioned in the episode, even if it could be a slip of the tongue. Based on this premise, Voyager can travel 27.4 ly in 4 days. If this is a third of the distance, the whole route is approximately 82 ly long. The comparison of this route (on the map 38 pixels) with the whole shown territory of the Swarm leads to a dimension of the shown region of nearly 570 ly - and borders aren't visible. 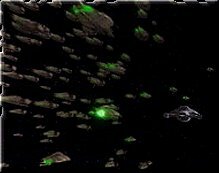 After all these calculations, we certainly know that the territory of the Swarm is really quite large, but it seems to be considerably smaller than for instance Borg space, and it is restricted to a length of less than 1000 ly, because the crew never met the Swarm again. After she has already left the sphere of influence of the Kazons, the Vidiians and Talaxians, the USS Voyager finally reaches the physical border of known space in the middle of the year 2373, approximately on stardate 50443: the Nekrit Expanse, which only few starships have crossed yet. The knowledge of what lies behind this final frontier is limited to myths and legends, and even Neelix, who was the guide of the crew of Voyager through the Delta Quadrant up to that moment, cannot fall back on his former experiences any longer. The Nekrit Expanse is described as an extensive, not surveyed, instable region of space which is full of interstellar dust clouds and plasma storms, but contains only few planets. The expanse has a width of several thousand light years, but seems to be not very deep since Voyager can cross the region in relatively short time. She enters the Nekrit Expanse in "Fair Trade" and apparently already leaves it sometime between "Unity" and "The Darkling", because in the first episode, the expanse is explicitly mentioned (and shown), while in the latter one, with the arrival at the Mikhal outpost Voyager enters a completely new, unknown region of space, and the expanse does not play any part in the following episodes. Consequently, Voyager was definitely inside the Nekrit Expanse between stardate 50443 and 50654 - what results in a total time of 211 stardate units or 77d. If Voyager travelled only at an average speed of warp 6.2 during this two and a half months, then the expanse has a depth of 92.398 ly. However, it is more likely that Voyager travelled at a considerably faster speed during that time. In "Fair Trade", it was mentioned that there are only few planets within the expanse and Voyager loads all necessary supplies for the journey in this episode so that regular stops aren't necessary in the end. This assumption is confirmed by the small number of missions while they travelled through the expanse (visit of four planets). Therefore using the maximum cruising speed of Voyager - warp 8, we get a depth of 216.017 ly for the Nekrit Expanse, a figure, that is considerably more plausible in view of the large width and the ignorance of the people in the regions explored by the USS Voyager about the space behind the expanse. 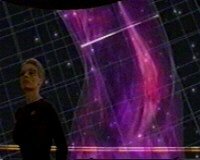 In late 2374, on stardate 51929.3, the USS Voyager reaches a vast Mutara class nebula, whose borders are beyond the sensor range. Therefore Voyager can't fly around and also cannot simply travel through due to dangerous radioactivity within the nebula. 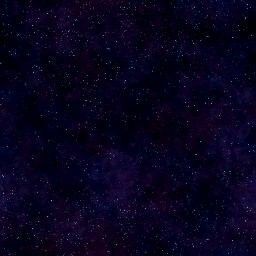 In the astrometric lab, Captain Janeway and Seven consider the remaining possibilities by scanning the spatial size and shape of the nebula with the more advanced astrometric sensors. The map on the right is a two-dimensional reproduction of the extraordinary three-dimensional visualization shown in the episode. 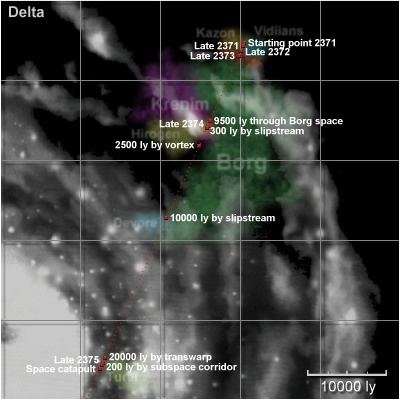 However, the map, which also contains Voyager's route and the locations mentioned in the episode (see table below), only approximately depicts the borders and with a relatively high error rate, because the nebula has an unusually difficult shape and a variable expansion in the Z-direction, what is shown on the map by several nested borders. The expansion of the nebula is said to be at least 110 ly, perhaps even more. It would take Voyager a month to travel through and more than one year to fly around. Due to the sub-nucleonic radiation, the crew has to stay unconsciously in stasis chambers during the travel through the nebula and assign command to Seven. The following table based on Seven's log depicts the most significant events. 51929.3 10 30% of distance. Daily routine. Finally a false sensor alarm. correctly: 51981.4 29 6d 5h 68% of distance. First computer errors and hallucinations of Seven. Eventually the doctor fails. The stardate is completely wrong. Because Seven's Trajis-hallucination mentions 3 (instead of 4) weeks in the nebula, the calculating errors might be due to Seven's condition, because the 29 days must be correct because of the computer ETA (6d 5h) and the previous estimation (a good month). 51995.1 34 17h 11min 95% of distance. The system fails and hallucinations of Sevens increase. Day and stardate are calculated. 51997.8 35 41 min 99% of distance. The warp engines fail. Seven transfers energy from the stasis chambers, but finally deactivates life support. Day and stardate are calculated. 51997.9 35 0 min Nebula crossed. Day and stardate are calculated. Note: Because of the incorrect stardate calculation (2.7 days / unit instead of the correct 2.7 units / day) this episode overlaps with the next one, [VOY] Hope and Fear. 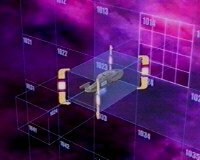 Because we finally know the exact travel time for crossing the Mutara class nebula, we can now determine Voyager's average speed. Although calculations are influenced by the much lower speed at the end of the journey, Voyager had to sustain warp 8.25 on average to cover 110 ly in 35 days. That seems to be too high; but perhaps the distance was much shorter than the mentioned expansion of 110 ly, since Voyager (as it could be seen on the map) travelled through the nebula at a narrow part. 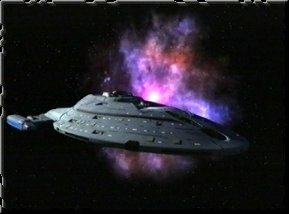 Summarizing, most episodes seem to confirm the calculated route of Voyager. However, there are countless possible variants that would roughly match with the distances given in the episodes. Surely the ST:VOY Technical Manual - should it ever be published - will show a completely other picture of the journey, but until then, the depicted table is as exact and "canon" as possible in view of the many variables that have to be taken into consideration and the many discrepancies and errors in the show itself. Concluding, the following table lists some of the congruences as well as the discrepancies of the calculated route and the actual distances mentioned in the series. In the end, the last leap on stardate 53329 and the distance Voyager has bridge since then results in a distance of 30067 ly to Earth in the middle of season 7 (by stardate 54500), if the already covered part of the annual distance (219 of 438 ly) is included in the calculations. 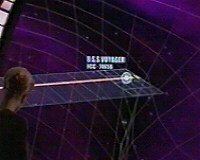 Consequently, at this time Voyager is only 1944 ly away from the border of the Delta Quadrant, using the revised distance of Earth from the Galactic core (25,800 ly). Hence, she will probably never reach the Beta Quadrant, which is inexplicably a taboo in Star Trek: Voyager, but will surely directly travel back to Earth (by slipstream, transwarp or whatever propulsion technology or powerful being) by the end of season 7, if the "policy of small leaps" of the recent episodes is kept up.